Iowa Barnstormers Head Coach and Director of Football Operations Mike Hohensee dropped a bombshell on the Arena Football League late this afternoon, announcing that the team has reached agreement with All-AFL Wide Receiver Jesse Schmidt for three more seasons. 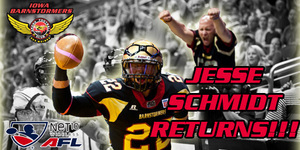 The 2013 season will be his fourth season as a member of the Barnstormers. The Laurens, IA native and Buena Vista alumni has been voted the Barnstormers’ offensive MVP following each of the last three seasons. Schmidt (6-3, 225) is coming off his best season ever in 2012, where he recorded 172 receptions for 2,218 yards and 58 touchdowns, all single season AFL records. He began his Arena Football career with the Quad City Steamwheelers (af2) in 2007. Although he appeared in just 3 games, he was able to find the end zone 3 times, making an impression with the coaching staff. He returned to the Steamwheelers in 2008, recording 131 receptions for a league-leading 1799 yards and 47 touchdowns. His efforts were rewarded by being named to the af2’s all-conference first team. The 2009 season was Schmidt’s best in af2, as he finished with a remarkable 172 catches for 2,390 yards and 58 touchdowns. He was rewarded by being named to the all-af2 first team and was named offensive player of the week five times.